This hand colored map is a copper plate engraving, dating to 1849 by the legendary American Mapmaker S.A. Mitchell, the elder. It represents the state of Florida. This historically important map is extremely rare as it existed only in the 1849 edition of the Mitchell's Universal Atlas. 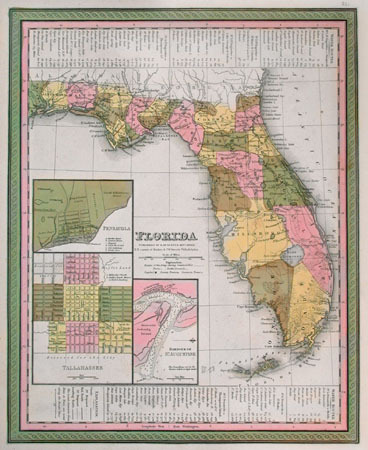 There are inset maps of Tallahassee, Pensacola and St. Augustine. The Saint Augustine map includes depth sounding of the harbor and Matanzas River. All swamps are carefully shown, as are the many roads that seem to disappear into them. Above and below the map there are charts depicting relative distances between towns via canal, river, and sea. Political boundaries as well as major rivers, territories, and counties are carefully labeled. Also included are major canals, explorer's routes, roads, trading posts, and extant & proposed railroads. Further, all notable mountains, passes, and even important trading posts are labeled, as are bodies of water, rivers, mountains, islands, and sub regions. Most major national and local political distinctions are outlined and defined by vibrant color: reds, greens, yellows & browns. This map is dated and copyrighted, 1849. This stunning map is a copperplate engraving and was once part of the great 1849 edition of Mitchell's Universal Atlas. This is one of the first atlases Mitchell ever produced and perhaps the finest 19th century American Atlas ever made! These rare maps with their elaborate green and purple had painted borders, bright colors, extraordinary detail, and fine engraving almost never appear in galleries.